Men's Big & Tall Hoodie is in stock. We will print it as soon as you order it. This midweight Hanes classic is big, roomy and extra comfortable. Perfect as an outer or under layer, the men’s hooded sweatshirt has become a staple of any wardrobe. Kangaroo-style front pocket is perfect for your phone, keys or anything else you want to stash. I absolutely love it! It looks great, feels great and I will be ordering more items from here! The quality of the printing is perfect as always and it fits just right! I love my hoodie. But for a 4XL it runs a little small. what was sent to me was a standard 3XL, not even close to a Big & TALL. 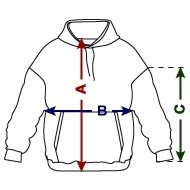 We are very accustomed to ordering Big and Tall and there is nothing tall about this hoody. Extremely disappointed. if you would like to make good on the order, I would be happy to review on Google appropriately.